The unbeaten Camelot, who underlined his class with an impressive five-length victory in Britain’s premier Classic on Saturday, leads the way in the first standings issued for the 2012 Cartier Racing Awards. Camelot, trained by Aidan O’Brien and ridden by his son Joseph, tops both the Cartier Three-Year-Old Colt and Cartier Horse Of The Year points’ tables, thanks to his victories this year in the 12-furlong Investec Derby at Epsom Downs on June 2 and the other British colts’ Classic, the QIPCO 2000 Guineas, over a mile at Newmarket in early May. With 96 points, he is well clear of Saonois (58), another recent Classic scorer who was successful in the Prix du Jockey Club, the French Derby, over an extended 10 furlongs at Chantilly on Sunday, June 3. Frankel, the other great colt racing in Europe this year, was of course the Cartier Horse Of The Year in 2011 as well as the Cartier Three-Year-Old Colt. The Sir Henry Cecil-trained four-year-old made a brilliant return in the Group One JLT Lockinge Stakes at Newbury in May, to achieve a perfect 10 wins out of 10 runs but other busier horses currently lead the way in the Cartier Older Horse standings. 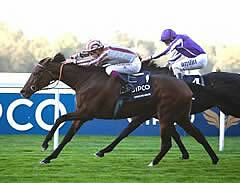 Cirrus Des Aigles, the Cartier Older Horse of 2011, is making a bold bid to retain the title this year. The six-year-old has already won two Group One races in 2012 - the Dubai Sheema Classic Presented by Longines and the Prix Ganay - and on 72 points is ahead of Dubai World Cup Sponsored By Emirates victor Monterosso (51) and another Godolphin horse Capponi (48), with the Diamond Jubilee Coronation Cup Sponsored By Investec victor St Nicholas Abbey in fourth (46 points). 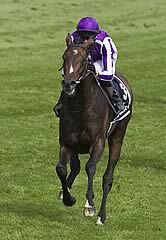 The big question now is will Camelot be aimed at the British Triple Crown, which means running in the Ladbrokes St Leger at Doncaster in September over an extended 14 furlongs, or could he drop down in trip and maybe meet Frankel, who is due to step up to 10 furlongs from a mile later this year. The Flat season stretches into November, with the 2012 Cartier Awards announced on the 13th of that month, so there is a long way to go before everything is decided. Two fillies, trained by O’Brien, lead the way in the Cartier Three-Year-old Filly Award - Homecoming Queen (51), who made all in the QIPCO 1000 Guineas at Newmarket, and Was (49), successful in the Investec Oaks at Epsom Downs on Friday, June 1. European horseracing’s equivalent of the Oscars will be presented during a glittering ceremony before an invited audience at London’s Dorchester Hotel.